I love the crunch of a good slaw but have never been a fan of the classic creamy coleslaws. Since vinegar-based slaws are more my speed I concocted this Carrot, Apple & Radicchio slaw using the abundance of apples I had this fall. It’s the perfect combo of sweet, savory and slightly bitter and makes an excellent healthy side dish for spicy foods. I also like serving it as a pretty confetti over a dry-rubbed grilled pork chop or as a crunchy topping on a BBQ pulled pork sandwich. Chop radicchio and place in a medium bowl. Peel and julienne carrots or add pre-julienned matchstick carrots to the radicchio. Carefully julienne apple and add to salad. Lightly toss vegetables with a tongs to mix. In a small bowl, whisk together olive oil, vinegar, mustard and brown sugar until emulsified. Pour over slaw and toss to mix. 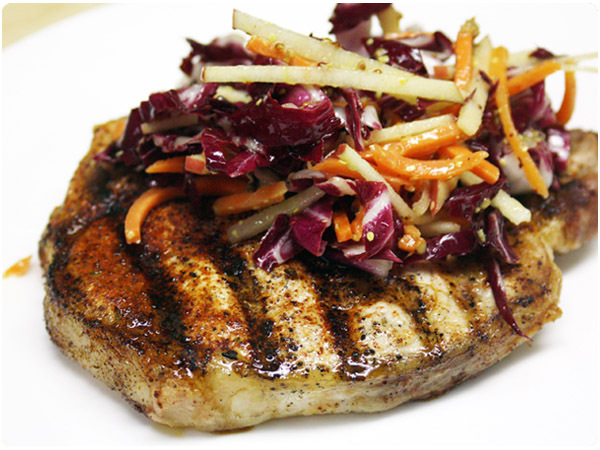 Serve as a salad, on grilled pork chops or with BBQ pulled pork sandwiches. Looking for more carrot options for your Thanksgiving sides? Check out these recipes from our friends at the Food Network Dish blogger round-up! 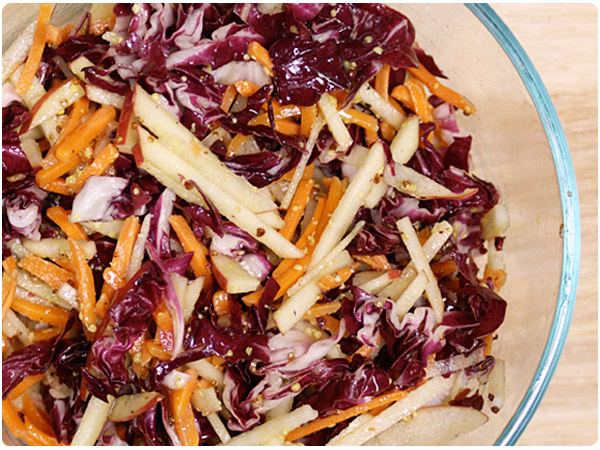 I love your idea of using this colorful slaw as a topping for BBQ Pulled Pork… YUM! Can hardly wait to try this! Very healthy, too…thanks for sharing! Spot on with this write-up, I honestly believe this website needs much more attention. I’ll probably be back again to read through more, thanks for the information!